WHEN Fairy King (USA) bowed off the track after only one unplaced run, having broken a bone in his hoof during the race, few could have realised the impact he would have in the breeding barn. He is the great-grandsire of this month’s stallion profile subject Zoustar, a son of Northern Meteor and grandson of Encosta de Lago. That Fairy King, who was bred by Robert Sangster’s Swettenham Stud and partners, was given a chance at all was due to his illustrious breeding. He became one of the very best examples of the old saying “blood will out” with progeny ranging from Arc de Triomphe and English Derby winners in the northern hemisphere to Gr.1 winner and champion sire Encosta de Lago, born from a cover in the first of his two southern shuttle seasons, 1992 and 1996. Fairy King (Northern Dancer-Fairy Bridge by Bold Reason) is a year-younger brother to 14 times Champion UK-Ireland sire and Gr.1 winner Sadler’s Wells and a three-quarter brother to outstanding sire Nureyev, also a son of Northern Dancer and from Fairy Bridge’s dam Special (Forli-Thong by Nantallah). Fairy King started his stud career in very modest circumstances in Ireland and pulled himself up by the bootstraps to eventually join his brother at Coolmore headquarters, becoming Champion Sire in France in 1996 when his son Helissio won the Arc and was European Horse of the Year. He had further success in France with Victory Note (French 2000 Guineas) and Second Empire (Grand Criterium), while Falbrav, the Champion Older Horse in Europe in 2003, would win a Prix d’ispahan as well as the Japan Cup, Queen Elizabeth II Stakes, Eclipse Stakes, HK International Cup and Juddmonte International Stakes. He also sired the Japanese Gr.1 winner Shinko King, the Irish dual Gr.1 winner Turtle Island (Phoenix Stakes, Irish 2000 Guineas), Oath (English Derby) and Beckett (Irish National Stakes). Many of these Gr.1 winners were disappointing at stud, although Helissio left the triple Gr.1 winner Helenus in Australia (in turn sire of Gr.1 winners Cedarberg and Ethiopia), and the male line looks shaky in Europe. However just one major son in Australia has been enough to give the Fairy King line a chance to shine here with the Invitation Stakes (VicHealth Cup)-Gr.1 (1400m) winner Encosta de Lao (ex Shoal Creek by Star Way (GB)), also winner of the Ascot Vale-Gr.2 (now Coolmore) and the Bill Stutt Stakes-Gr.2 and three times third (Caulfield Guineas-Gr.1, Maribyrnong Plate-Gr.2 and Debutante Stakes-LR) becoming an instant success here, despite starting off with middle range mares in Victoria in 1997. Champion Sire in 2007-08 and 2008-09 and a fixture in the top 10 since then, he has left more than 1000 winners of $137m (68.9% of starters) and his 103 stakes winners (7.1%) include 67 successful i n Group events (22 Gr.1) including Racing to Win (Kenny’s Best Pal), Alinghi (Monde Bleu), Sacred Kingdom (Zeditave), Mnemosyne (Canny Lad), Sirmione (Defensive Play) Quay Lago (Ultra Fantasy HK) (Sir Ivor), Northern Meteor (Fappiano), Manhattan Rain (Canny Lad), Costa Viva (Bel Esprit) and Apercu (Zabeel). Twice Champion Sire (2007-08 and 2008-09) and runner-up four times, his winning dam is a half-sister to Golden Slipper winner and champion sire Flying Spur (Danehill (USA)-Rolls (USA) by Mr. Prospector) and his third dam is the Sir Ivor mare Grand Luxe, a daughter of Gr.1 winner and outstanding broodmare Fanfreluche (Northern Dancer). Encosta de Lago got Northern Meteor from the regally bred stakes placed Explosive (USA), a daughter of influential Mr. Prospector son Fappiano and the Forli mare Scuff, the latter a sister in blood to Special, both being daughters of Argentinian champ Forli and from sisters. Special is a daughter of Thong, while Scuff is a daughter of Moccasin (Nantallah-Rough Shod by Gold Bridge). Special is the second dam of Fairy King (as well as being the dam of Nureyev) and Special/Scuff appear 4x2 in Northern Meteor’s pedigree. He is also 4fx3m to Mr. Prospector and linebred to that horse’s grandsire Native Dancer. Northern Meteor won three races including the Ascot Vale-Gr.1 (Coolmore) over the Flemington straight 1200m and was runner-up in the T.J. Smith-Gr.1 (1200m) at Randwick and fourth in the VRC Newmarket-Gr.1, also at Flemington. He was retired to stud after just nine starts by owner Eduardo Cojuangco, as he is a firm believer that lightly raced colts make outstanding stallions. Lucky for the Australian breeding industry that the Gooree Stud owner made this decision as the colt retired to Widden in 2009 and was enthusiastically received, covering 198 mares at $33,000 and followed up with books of 156, 108 and 160 before his early death on July 30, 2013, just a couple of days before being honoured as Australia’s Leading First Crop Sire of 2012-13 with 18 winners of $1.867m including Romantic Touch (Snippets), successful in the J.J. Atkins-Gr.1 and Zoustar runner-up in the Atkins, also won BRC Sires’ Produce-Gr.2. Towards the end of the 2013-14 season, the loss of Northern Meteor becomes even more apparent as his 83 winners (63.4%) of $7.5m include 10 stakes winners (7.6%) led of course by dual Gr.1 winner Zoustar and also including his most recent Gr.1 winner Cosmic Endeavour (Danehill), who won the $500,000 Tatts Tiara-Gr.1 at Eagle Farm in late June and is also a dual Gr.2 winner (six wins and earnings topping $1m), Gr.2 winner and Gr.1 runner-up Eurozone (Don’t Say Halo), who also retires to stud in 2014, Gr.2 winner and Gr.1 placed Bound For Earth (Belong to Me), Gr.3 winner The Voice (King’s Theatre; has brothers Fairy King/Sadler’s Wells 3x3) and Listed winners Atmospherical (Flying Spur; inbred 4fx3m Rolls, plus has sisters Thong, Moccasin and Lisadell 6,4x5), Fighting Sun (Ivory’s Irish, inbred 6,4x4 to sisters Moccasin and Thong), also retiring to stud in 2014 and Veuvelicious (Medicean) along with stakes placed Northern Glory (Viscount), Gr.1 third Equator (Desert Sun), Mr Jackman (General Nediym), Mount Zero (Royal Academy), Swing Vote (Danehill Dancer) and Mr Bogart (Snippets). His progeny have a winning distance index of 1271m. Zoustar (ex Zouzou by Redoute’s Choice), a $140,000 Magic Millions buy, heads his honour board with six wins and a second in nine starts and earnings of $1.4m. Fresh from a trial win over 900m (beating Charlie Boy) on April 2, trainer Chris Waller opted to give his talented juvenile his first start in an 1100m 2YO maiden at Canterbury on April 17, 2013 and he scored a strong win on a slow track having 1.75 lengths over Tweet at the finish. He lived right up to that form next time out on May 4 when he led most of the way to claim at $100,000 juvenile event at Hawkesbury by a length from Divine Calling, running the 1300m in 1:17.0 and prompting jockey to declare, “It was a comfortable win, it was only his second run and he’s still learning his trade, but my word he gave me a great feel and we will be hearing a lot more from him if he goes to Brisbane.” Trainer Waller exercised that option and he lined up in the BRC Sires’ Produce-Gr.2 (1350m) on May 25. Zoustar led home the field of 15 by 1.25 lengths, relegating the talented Vilanova and Bound for Earth into the minors, running 1:20.53 on a track rated dead. He wasn’t disgraced in Gr.1 company next time out (June 8) when a half-length second to another Northern Meteor, the gelded Romantic Touch, in the $500,00 J.J. Atkins (1600m), with Paximadia third in the field of 13. It was his final start as a juvenile. He was back in action early in the new season with a fourth in the Run to the Rose-Gr.3 (1200m) at Rosehill on August 31, beaten 1.75 lengths by Va Pensiero. Next start was another Gr.1 assignment, this time in the Golden Rose (1400m) at Rosehill on September 14. Settling well back in the field of 15 and skirting wide most of the way to avoid trouble, the three year-old colt swept around the field with 200m to go and with Jimmy Cassidy working hard got the better of Dissident on the line to win by a neck, with Bull Point 1.5 lengths back in third. The winner’s time was 1:22.51. There was another win next time out, at Randwick on October 5, when Zoustar captured the Roman Consul Stakes-Gr.2 (1200m in 1:09.45) by 4.25 lengths from Barbed and Open Book, clearly signalling he was one of the best young sprinters in the land. Clearly several of our major studs thought so too and in the end Widden won the bidding duel for the talented three year-old paying a rumoured $14m, with contingencies, so there was plenty on the line when he lined up in the VRC Coolmore Stud (Ascot Vale) Stakes-Gr.1 down the Flemington straight on November 2 (including an additional $4m payment to his former owners if he won). In the end he simply powered away, cruising to the lead at the 300m to win the $500,000 1200m sprint, running 1:09.23 on a dead track to beat Not Listenin’tome by two lengths and with Lion of Belfort third in the field of 11. There was plenty of emotion in the saddling enclosure after the race with Jim Cassidy, who celebrated his 100th Gr.1 win (a feat only achieved by Roy Higgins and George Moore), feeling his ribs after a bear hug from Sherrif Iskander, the man who purchased, syndicated, raced and then sold Zoustar and who was so overcome with emotion after the race he briefly fainted in the mounting enclosure. His new connections, Widden sold 25% to Woodside Park (where the horse will cover in his second and fourth seasons) as well as an interest to Sheikh Fahad Al Thani’s Qatar Bloodstock, began planning an assault on Royal Ascot and the horse was given a break until early 2014 when he appeared in two trials before an unplaced run in the Canterbury Stakes-Gr.1 on March 15 and then a trial win on March 31 before shipping out to England. “I was able to inspect Zoustar with my bloodstock advisor David Redvers following his dominant win the Coolmore Stud Stakes at Flemington. 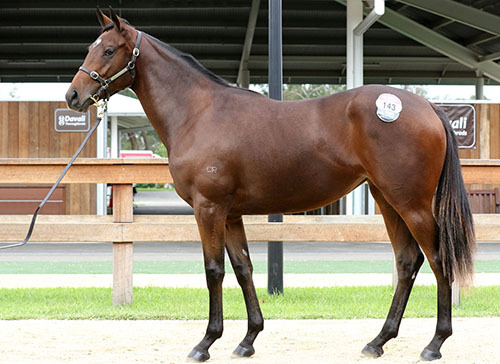 This colt represents everything that is great about Australian horses. He is strong, masculine and incredibly fast and I am very excited about the prospects of him racing in Europe and ultimately retiring to stud,” Sheikh Fahad said. Qatar Bloodstock advisor David Redvers noted that Zoustar’s Coolmore Stud Stakes victory was some 1.2 seconds quicker than Buffering’s Gr.1 WFA win a week later. His time was 1.3 seconds faster than his sire and grandsire Northern Meteor and Encosta de Lago clocked in their Coolmore victories. Having close access to a colt such as Zoustar highlights a mouth-watering opportunity for Victorian breeders Woodside’s managing director Mark Rowsthorn said. “We are very excited to have him racing in Europe and for his eventual arrival to Victoria. We have already received terrific support from the local breeding industry,” he added. The horse was showing sparkling form in his gallops in the UK when he suffered a small strain to the lateral aspect of the proximal suspensory ligament. Although not serious, the injury meant three months off racing and the decision was made to retire the valuable colt immediately. “It is extremely disappointing that we are not able to compete at Ascot and the owners and I are devastated by this. The horse had travelled extremely well to England and for me it was the start of what would have been the experience of a lifetime. Zoustar’s ability, attitude and physical attributes as well as his gentlemanly temperament make him a tremendously special horse to me,” Waller said when announcing the horse’s retirement as the winner of six of his nine starts for earnings of $1,411,680 and a World Thoroughbred Ranking of 117 (in 2013). Zoustar is from the Redoute’s Choice mare Zouzou, who was bred by C. and R. Thurecht Pty Ltd at their Westminster Stud, Razorback by putting their handy racemare Meteor Mist to the then first season sire on the advice of Bluebloods publisher Andrew Reichard in 2000. Zoustar was bred in Queensland by Kevin Dixon’s Racetree, who purchased Zouzou for $40,000 when she was offered for sale in foal to Northern Meteor by former Westminster manager Phil Greenwood at the 2010 MM Broodmare Sale as he was dispersing his bloodstock interests. Zoustar was first in the ring as a weanling and sold to KP Thoroughbreds for $85,000 at the 2011 MM National Sale. Chloe Latif and Rhys Smith took him home to their Blandford property Kulani Park and offered him as a yearling at the Gold Coast seven months later where the colt was snapped up by Iskander Racing for $140,000. He was initially raced by Iskander.Com (manager, S.R. Iskander), Ms J.L. Leslie, N.J. Bearman, S. Hedge, S.R. Ellis, A.P. Mcguinness, J.R. Pritchard, J. Holloway, J.M. Mahoney, Miss C.V. Matthews, J.L. Ellis and E.J. Hughes. Zouzou (Redoute’s Choice-Meteor Mist by Star Shower), an $80,000 Magic Millions yearling in 2003, won over 1200m for Chris Waller before going to stud in 2006. She foaled Drill Bit (Starcraft) in 2007 and then missed in 2008 and 2009 before producing Zoustar. She had a filly by Hotel Grand in 2011 and another by Northern Meteor in 2012 before missing to Pressday in 2013. She was sold in foal to All Too Hard at the 2014 Magic Millions National Sale for $775,000 with her buyer, Coolmore Stud’s Tom Magnier, indicating she will likely go to Pierro in the coming season. Her dam Meteor Mist was a handy racemare for the Thurecht family winning 12 races including a Sydney event and producing four winners from five foals including Group placed Crestfallen (Rivotious (USA)) and the dam of Gr.2 winner Dusty Star (General Nediym). She is a daughter of Blue Diamond Stakes-Gr.1 winner Star Shower (by Biscay’s brother Star of Heaven and from Show by Novalis (GER)) and Sunbuster, a winning daughter of another Thurecht-raced horse Blockbuster (Streetfighter (GB)-Surpass (NZ) by Messmate (GB)), winner of the 1977 George Main Stakes, Phar Lap Stakes, Theo Marks Quality and Linlithgow Stakes and who left some handy performers from his time at Westminster including stakes placed Snowblock, Hot Block, Planet Buster, Glossy Cube, Kashano and Buster’s Pride among 44 winners (142 wins). His daughters produced 48 winners including stakes winners Shags, Hot to Race, Boisterous Lady and Licence Renewed, the last three sired by another Westminster Stud horse in Rivotious (USA)). Sunbuster also produced multiple city winner Star Spectrum to a cover by Star Shower and she is the dam of stakes placed Spectrascope (dam of stakes placed Silver Spur). Meteor Mist is inbred 4fx3f to Wilkes (FR), and the three-time Champion Australian Sire appears as the damsire of Covent Garden (second dam of Star Shower) and as the sire of Sunshine Lass, fourth dam of Zouzou. Unraced Sunshine Lass is a sister to VATC Debutante Stakes-LR winner and AJC Gimcrack Stakes-Gr.3 runner-up Young Victoria. Sunshine Lass’s four winners include city winner Ksar Miss (Ksar (FR)), dam of stakes winners Diamond Benny and Hit it Star (both by Hit it Benny) and second dam of Hitapotomoss (Twig Moss (FR)). Zoustar’s fifth dam Born Lucky combines the blood of two of Australia’s racing greats as she is by the AJC and VRC Derby winner Talking (Magpie (GB)-Society by Absurd) and from Grandeur by Heroic (Valais (GB)-Chersonese (GB) by Cyglad). Born Lucky raced twice but she is a sister to tough performer Grand Monarch (12 wins, Gr.3 placed), while unraced Grandeur is a sister to AJC Anniversary Handicap winner Hope, while two of her sisters produced stakes winners. Heroic won 21 of his 51 starts including the AJC Derby, Caulfield Guineas, Memsie Stakes, Caulfield Stakes and Cox Plate before going on to become a seven-times Leading Sire in Australia (1932-33 to 1938-39). Zoustar is a member of family 8k which arrived in Australia with the importation of Lady Chester (GB) (1870, Stockwell-Austrey by Harkaway), his 12th dam. Her foal of 1874 was Chester (Yattendon), who won the AJC Breeders’ Plate, Champagne Stakes and Sires’ Produce at two and then trained on to collect the VRC Derby and Melbourne Cup among his many other wins, and the family has flourished ever since. Lady Chester’s daughter Lady Granville (Chandos (GB)) founded a successful branch of this line that continues to Zoustar. Zoustar, whose fee at Widden is $44,000, stands 16.1 hands and is inbred 4mx5m to Northern Dancer. His sire has worked well with horses from the Rough Shod family and also with the blood of Lunchtime and Biscay (as in Canny Lad) and with Danzig (Redoute’s Choice, Belong to Me). Line breeding to the significant female influences in his pedigree (Fanfreluche, Special, Best in Show) or introducing further Mr. Prospector (he appears twice in Northern Meteor’s pedigree) or Wilkes (especially using Vain) could also prove fruitful. Introducing Danehill via daughters of Flying Spur or Al Maher are interesting inbreeding options. The Filly purchased is out of the Winning Mare FRIM AND FROME and this is her first foal and what a first foal it is. The fillies family is littered with winners and outstanding quality GROUP and black type performers all of the way down her Pedigree page and she holds great residual value at the end of her racing career. They include some of the best in the land from previous generations in BONARIA-Winner of the VRC Myer Classic at GROUP 1 level, MERCHANT NAVY-Winner of the GROUP 1 VRC Coolmore Stud Stakes, UNEARTHLY-Winner of the GROUP 1 AJC Flight Stakes, INVEST-Winner of the GROUP 1 SAJC Schweppes Oaks, INNOCENT KING-Winner of the GROUP 1 AJC Derby AND GROUP 1 STC Rosehill Guineas OUR PLANET-Winner of the GROUP 1 Queensland Derby, ROYAL SNACK-Winner of the GROUP 2 VATC Sandown Cup, BURBERO-Winner of the GROUP 2 ATC Missile Stakes, PASTA EXPRESS-Winner of the GROUP 2 NSW Tatt’s RC Chelmsford Stakes AND GROUP 2 STC Hill Stakes, JOLIE BAY-Winner of the GROUP 2 ATC Roman Consul Stakes, CLASSY FELLA-Winner of the GROUP 2 STC Gloaming Stakes, TWIRLED-Winner of the GROUP 2 VRC Bloodhorse Breeders Plate, as well as a host of GROUP winners closer up in the family including TAIKUN,SUPER GROOVE,BOOGALOO,IRISIS,PURPLE GROOVE,ZAPURPLE and FLYING FULTON-the list just goes on and on and on! The filly will be going into Mick’s 2YO program later in the year and is not only nominated for the rich Inglis race series which in itself is a wonderful series to be a part of BUT is also eligible for the recently launched VOBIS SIRES! which includes a Restricted 2YO $1,000,000 Race in April 2019! She is an outstanding individual and personally, I am very proud for her to be coming under the United Syndications banner!